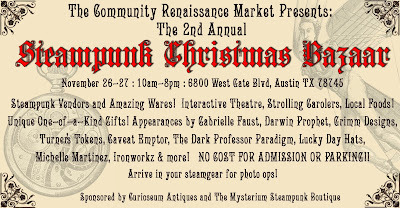 Steampunk Vendors and Amazing Wares! Interactive Theater, Strolling Carolers, Local Foods! Unique One-of-a-Kind Gifts! 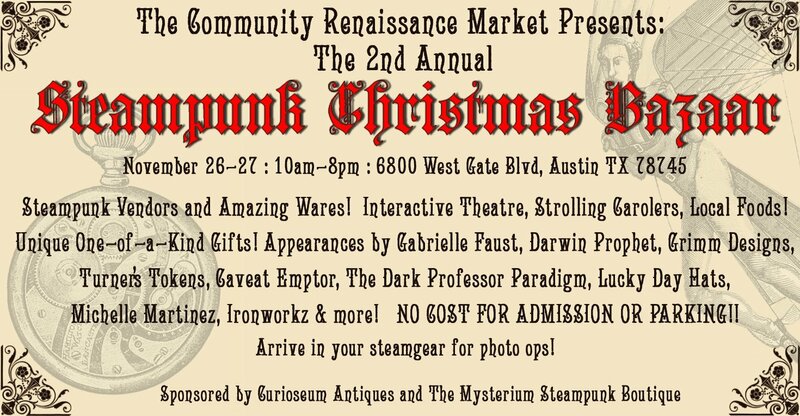 Appearances by Gabrielle Faust, Darwin Prophet, Grimm Designs, Turner's Tokens, Caveat Emptor, The Dark Professor Paradigm, Luck Day Hats, Michelle Martinez, Ironworkz & More! NO COST FOR ADMISSION OR PARKING! Arrive in your steamgear for photo ops!